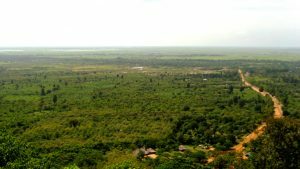 Kam Pong Luong Resort is a natural site located on the Tonle Sap in Kampong Luong commune, Krakor district, about 35 kilometers east of Pursat provincial town. The site is a sand cape suitable for swimming during the dry season. During the rainy season, especially during Pchumben, many cambodians gather there to play Chaol Teuk Leak (a traditional Khmer game, played by throwing water on one another) on the river. The game can be dangerous, however, because it is often played while in small boats. 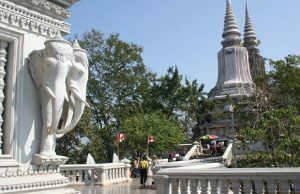 There are four other sites that Pursat residents prefer to visit. They include: -Kampeng: located in Pro Ngil village, Por Ngil commune, Kravanh district, about 20 kilometers from the provincial town. 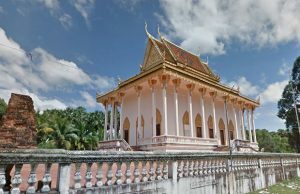 -Phnom Dak Preah: located in Roleap village, Roleap commune, Pursat district, about 10 kilometers from the provincial town. -Koh Sampeou Meas: located in front of the provincial hall in the middle of Pursat Island. It covers 2 hectares. 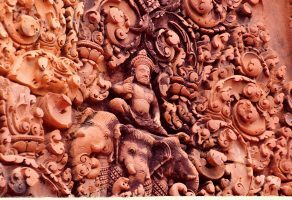 Preah Theat: located in Sre Sdok village, Sre Sdok commune, Kan Deang district, about 20 kilometers from the provincial town. This sites in Pursat province cater mostly to local people who visit them, especially on holidays or during the traditional festivals.Once past the mouth of the Tonle Sap, the floating village of Kompong Luong is found 30 kilometers into the lake, on its southwest shore. It's truly a floating village, with a large population of Vietnamese fishermen.Almost totally overlooked by tourists because of its remoteness and difficult access, the village is completely self-sufficient. A floating school, factories to make ice for fish preservation, church, pagoda, service stations, pigsty, stores, boat or television repair shops, video club, karaoke bar, police station... everything is on the water. All trades are represented and everybody from children to grandparents goes by boat through the network of canals that cross this little town.